The Department of Social Work is one of the larger departments at Gothenburg University, with about 1,400 students and 100 staff engaged in teaching, research and administration. Among its programmes one is a Master’s Degrees in Social Work with an international orientation (International Master of Science in Social Work). Ronny Heikki Tikkanen and Ing-Marie Johansson with their main Indian collaboration partner, Prof. Surinder Jaswal from Tata Institute of Social Sciences in Mumbai (second from left). Also Prof. Asha Mukherjee from the Dept. of Philosophy and Religion, Visva-Bharati University, Shantiniketan. 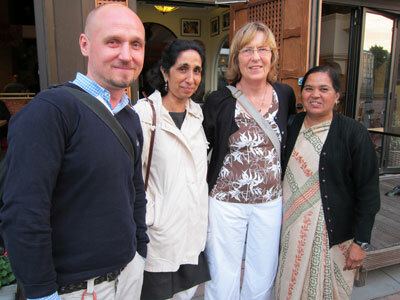 The department is strongly involved in the new go:India project launched by University og Gothenburg in November 2010. This will be a three year project (2011 – 2013), intended to build a platform for co-operation within the areas of research, teaching and education between its Swedish partners, also involving researchers at University of Gothenburg’s Faculty of Arts (Dept. of Literature, History of Ideas and Religion); Faculty of Fine, Applied and Performing Arts (School of Photography, and the School of Design and Crafts); and Sahlgrenska Academy (Global Health, Institute of Biomedicine), and their collaboration partner institutions in India. These are Banaras Hindu University (BHU) in Varanasi; Sarai/Centre for the Study of Developing Societies (CSDS) in Delhi; Gandhian Institute of Studies in Varanasi; Jadavpur University in Kolkata; Punjabi University in Patiala; Visva-Bharati University in Shantiniketan; Tata Institute of Social Sciences (TISS) in Mumbai; Srishti School of Art, Design and Technology in Bangalore; and Union Biblical Seminary in Pune. More information on the Go:India project web site. Since several years Björn Gustafsson, Professor in Social Work at the University of Gothenburg, is engaged in research on China. In collaboration with Vani Barooah, School of Economics and Politics, University of Ulster, Newtownabbey, Northern Ireland, UK, and Li Shi, Insitute of Economics, Chinese Academy of Social Sciences, Beijing, he has also made a compartive study of India and China. The three researchers presented a paper titled “China and India: Income Inequality and Poverty North and South of the Himalayas” at an International conference on ”Liberalization Experiences in Asia: a Comparative Appraisal”, jointly organized by Centre de Sciences Humaines (CSH,) in Delhi, the Indian Statistical Institute, Kolkata and the Indian Council of Social Science Research ICSSR, Delhi. This conference was arranged in New Delhi in January 2006, with support of the French Embassy in India, The World Bank, and Centre d’Études Français sur la Chine Contemporaine, CEFC in Hong Kong. More information about this conference (as a Word file). Abstract of paper: China and India are the most populous countries of the world and also the two largest contributors to World poverty as assessed by the World Bank. This paper, focusing on the rural circumstances is the first study using microdata to compare income inequality and poverty in the two countries. We find that at the mid 90s income inequality in rural China and rural India were relatively similar. Our results show that differences in mean income across regions are much larger in China than in India and accounts for a much larger proportion of income inequality in rural China. The proportion of the population falling under a poverty line set to 1 USD per person and day in Western China is similar to the corresponding proportion in several Indian regions but much higher than in the prosperous eastern part of China. Economic status in India is more influenced by education of household head than in China where fewer are illiterate. Common to both countries is that minority status as well as land status affect income and poverty. Syeda Shahanara Begum defended her doctoral dissertation entitled ”About Child Poverty – A Bangladesh’s Perspective” on Friday 1 June 2012. The faculty opponent was Professor Tapio Salonen, Malmö University. Syeda Begum, hailing from Bangladesh, has been supervised by Professor Björn Gustafsson. Deng Quheng, a Chinese guest researcher at the department has also been working together with Begum comparing child poverty in Bangladesh and China. Both quantitative (multivariate analysis and Logistic regression) and qualitative methods have been used for this kind of poverty research using the latest national micro data of Bangladesh Household Income and Expenditure Survey of the year 2000, which has been conducted by Bangladesh Bureau of Statistics (official data source of Bangladesh) with the technical and financial assistance of the World Bank. Abstract: Taking child poverty into account as an enormous concern on the pathway to human development, the thesis aims to examine child poverty’s extent and characteristics in Bangladesh, poor children’s views on this issue and their policy recommendation to reduce it. It also discusses how child poverty differ between Bangladesh and China, what are the reasons for the differences in child poverty over time between the two countries, and which measures are needed to reduce child poverty in Bangladesh according to its principal victims. The results show that Bangladesh’s children make up the greater share of the population, where almost half of the poor are children. Child poverty plays a vital role in the prolongation of developing, expanding, extending and transmitting poverty on to successive generations. Participants recommended a combination of policies to enhance the capability of poor children and their caregivers. Policy interventions need to give further attention to a reduction of parental poverty and income inequality, sustained economic growth, ensured access to education and health care, exposure of corruption and hidden costs of these services, and an elimination of mistrust of the recipients to speed up the extent of child poverty’s reduction in Bangladesh. Students from the department previously regularly participated in the so-called Sweden-India Project, initiated in the 1990s by Örebro University. This project involves travelling to India, and performing field practice with a base in Pune, Maharastra. More information. The department has later become involved in a Linnaeus-Palme International Exchange Programme with the Tata Institute of Social Sciences (TISS) in Mumbai, India. More information about the Linnaeus Palme programme, administered by the International Programme Office for Education and Training but financed by Sida. The collaboration project between the Dept. of Social Work, Gothenburg University and TISS was launched during the period 2009-10. Surinder Jaswal, Dean for the School of Social Work at TISS is the contact person for the Indian side. She is also ssociate Editor for the Indian Journal of Social Work. The project has received continued funding for 2015-16 with SEK 264 702. More information about South Asia related Linnaeus Palme programme grants for 2015-16.